It’s Monday! That means it’s time for another Children’s Style Guide! For this week’s Style Guide we have a girls spring look put together by the designer and founder of Taylor Joelle Designs, Jenny. 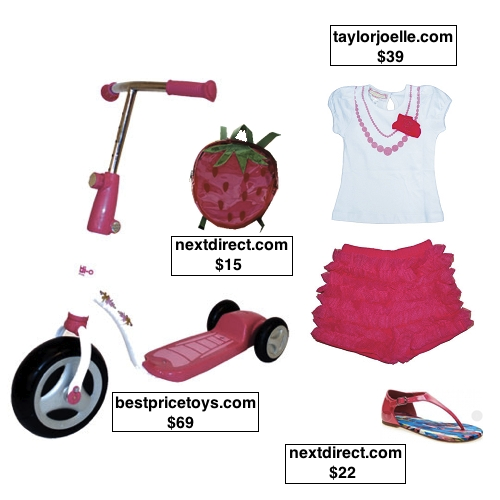 This look includes fun toys and accessories for your pink princess. If you are looking for the perfect look for your little girl this spring, you have come to the right place! We know that you’ll be inspired! Start the look with this adorable ruffle shorts outfit from taylorjoelle.com. Next, add these bright sandals from nextdirect.com. The sweet strawberry backpack from nextdirect.com will be perfect for her to carry her things in while she rides around on this pink scooter from bestpricetoys.com.